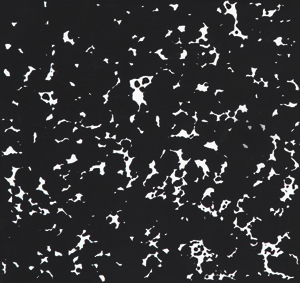 During my adolescence I discovered a lot of odd and interesting music and pop culture-related images and footage. Due to the magic of the internet, I was later able to Google them and see if anyone else had noticed the same things. Sure enough a lot of these have been discussed or explained online. This is an ongoing list of cool or strange things I have found in films, images, video games, and more. Discovery #1: Sadaam Hussein makes cameo in Marx Brothers movie. I had just bought my last Marx Brothers DVD boxed set. I popped in my favorite Marx brothers movie of all time...Duck Soup. I was enjoying myself until the scene "Were going to war" came. Groucho announced that Freedonia was going to war. 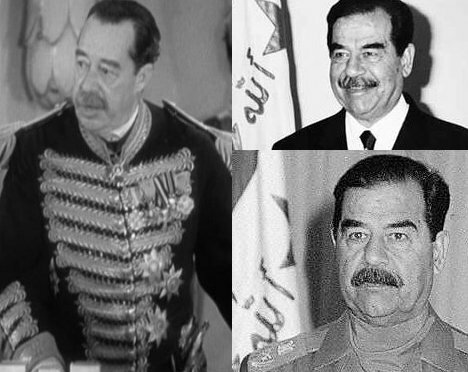 Every admiral got a chance to belt during the war song...my heart stopped when I saw what appeared to be Sadaam Hussein. "Oh my god is that Sadaam Hussein!?" I cried out. We skipped back immediately...and it wasn't Sadaam himself but a clone. And if it were Sadaam Hussien, he would have been negetive 4 at the time. Discovery #2: China acknowledges David Bowie's buldge. My boyfriend and I at the time discovered this after pirating every Nintendo game ever made. A Labrynth game! We decided to play it, and the intro nearly killed me of laughter. Apparently this game never came to America, but was partially translated from Chinese to English poorly. 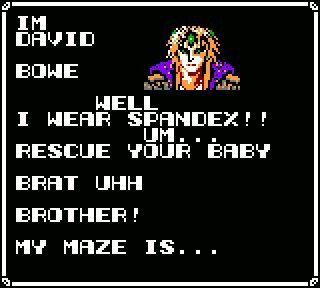 I love that fact that they mention that he wears spandex. I think China is trying to convince it's children that David Bowie is a flamboyant drug addict. 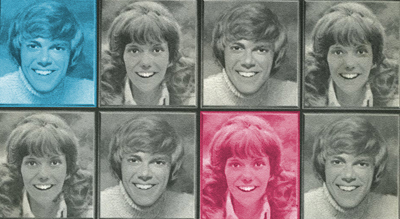 Discovery #3: The Mystery of the Carpenters interchangeable pitches. This is what I call a 'happy accident'. I was listening to various songs one day and started playing with the pitches with this program called AC97 audio configuration. I changed Karen Carpenters voice on "Sing" to the lowest pitch. She sounds exactly like her brother. Richard (her brother, the other half of "The Carpenters") doesn't sing to often but primarily on the Carpenters Christmas album (Christmas Collection). But their voices sound exactly a like, I kid you not. If you listen to any Carpenters song (Sing works well) use any program to change it to the lowest pitch she sounds like Richard. If you change Richards voice to the highest pitch he sounds like Karen as well. Ok they are siblings and it does make sense...but it is still neat none-the-less. Discovery #4: The re-appearing pinball machine. Ever notice that in The Who's Quadrophenia and in Tommy they use the same pinball machine? It's the Kings and Queens one. It's in the "pub scene" in Quadropehnia and in all the pinball scenes in Tommy! What is on Mick? I noticed after he ripped off his shirt on "The Rolling Stones rock and roll circus." 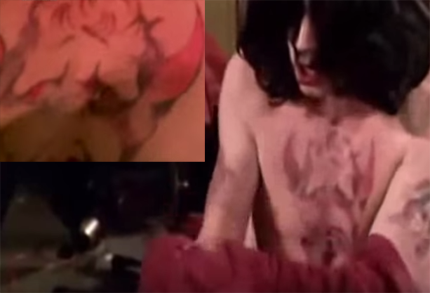 Ever take a double look at Mick's arm and chest during "Sympathy for the Devil"? One is a Devil illustration and the other is almost astrological looking. They are located on the bicep on each arm and the upper chest area. Upon doing research [online..through books..people], I can't find ANY back story for who did those drawings on Mick. If you have any further info, please email me. 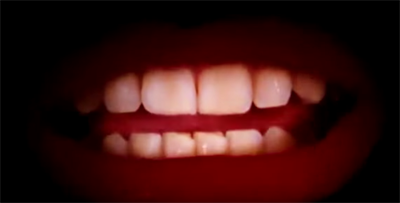 Discovery #6: Rocky Horror Lips with two rows of teeth: fact or science fiction? If you see the intro to Rocky Horror Picture Show "Science Fiction" there appears to be an extra row of teeth (on the bottum, watch closely). For years I was baffled by this and found next to no information about it. Until now! I got a super informative email from Carrie about the back story of the lips. "The famous lips that appear over the film's opening credits belong to Patricia Quinn, who had also sang the opening song, 'Science Fiction/Double Feature,' during the staged musical. The producers offered her the part of Magenta for the film, but explained to her that she wouldn't be singing the song for the film. She turned the part down initially, but after taking a tour of the sets she would be working on, she changed heart and took the part. Minus an opening song. It was O'Brien who would sing the opening song. That still doesn't answer the two rows of teeth question, but now we know it's Particia Quinn and NOT Richard O'Brien's teeth. If you have any further info, please email me. Discovery #7: I remember you! The mystery of the Joey Ramone clone! "Joey Ramone (?) at a Rolling Stones free concert at Hyde Park in July, 1969". "Wow, it's a doppelganger!! If that's Joey, then who was that guy in the bed across from me in our bedroom? That is really weird. I had to look at that clip like 20 times, until I could freeze it on frames where I could see the glasses the guy was wearing , which were more square shaped (Joey never wore glasses like that) as well as see a difference in his mouth and nose. I had to do that, even though I knew he was never in England in '69, because the resemblance was so astonishing. My mother agreed with me that it couldn't be Joey as he didn't even have a passport at that time. He had just gotten his draft card though. Well they say we all have one somewhere. Feel free, anyone, to inform the Wikipedia people that Joey's family confirmed, right here, that it is not him." OK, Mickey Leigh (Joey's brother) and mom say it's not him. Wikipedia was wrong (it happens)! To me the real give away that it can't be him is his height. Joey was 6'5" that guy looks to be no taller than 5'10" in comparison to the guys in the back ground. Now may I ask? Who is this Joey Ramone clone and does he have children? ?